Welcome back to the Ray Pest Control blog. Summertime is one of the peak seasons for bed bug activity. This is partly because people tend to travel more in the summer, which increases the risk for picking up bed bugs while staying in homes, hotels, and motels that may have a bed bug infestation. Bed bugs are notorious hitchhikers (hence the nickname “the hitchhiking bug”) and because of their small size, they go largely undetected until they have made your home their new home. While a bed bug infestation can be taken care of using a variety of bed bug treatments ranging from ineffective DIY products to professional bed bug removals, nobody wants to deal with a low- or high-level bed bug infestation. While bed bugs do not spread any known diseases, their bites can leave red, itchy, welts on the skin of people and pets. Plus, the thought of bloodsucking bed bugs crawling on you while you sleep is unnerving alone. As your Top Rated Local® bed bug removal experts in Piedmont, we want to help you identify bed bugs so that if you have a bed bug infestation, it can be dealt with immediately. 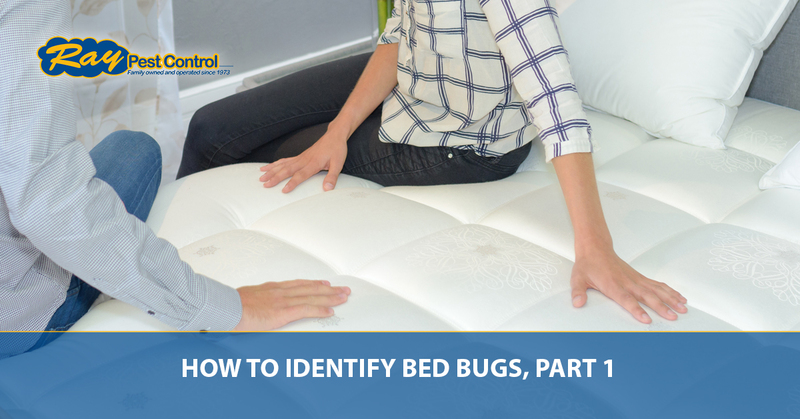 In today’s post, we will look at common signs to help you identify bed bugs in your home or lodgings while you travel, which may help prevent a major bed bug infestation. Should your home be overtaken by these nasty critters, Ray Pest Control is just a call or click away. We can inspect your home for bed bugs for free. Once we determine you have bed bugs, we will apply your preferred bed bug removal method ranging from chemical to bed bug heat treatments. Call us today! Adult bed bugs generally grow to about one-fourth of an inch in size, similar to that of an apple seed. They have flat, broad, oval bodies that look narrower at the head and balloon out at the body in bulbous shape. They are reddish or rusty-brown and appear even redder after feeding and becoming engorged on blood. They have six legs and antenna but do not have wings. One way to identify bed bugs is by their unpleasant odor. Bed bugs emit a sweet, musty smell, which is produced by glands on their body. You may notice this smell near areas where they frequent such as on beds, pillows, and upholstered furniture. Bed bugs are all-around unpleasant creatures that love to leave messes behind. A sure sign of a bed bug infestation is when you see red, brown, and sometimes even brownish-black stains on your bedding, carpets, and upholstered furniture. If it rusty red in color, this is likely the leftovers of a bed that has been crushed. The darker stains are, unfortunately, bed bug poo that looks similar to a marker stain. Bed bugs also cast their shells in a process called molting when they enter a new life stage, so if you notice shed bed bug skin, you likely have more than one bed bug. Eggshells are another common mess that baby bed bugs or nymphs leave behind. If any of these signs are familiar, call Ray Pest Control to schedule a free bed bug infestation. Once we identify bed bugs in your home or building, we will apply the most effective bed bug treatment that works best for your situation and preferences. From chemical treatments to extremely safe and effective bed bug heat treatments, we will eliminate your bed bugs and turn them into dead bugs. Don’t wait to call as your bed bug problem won’t just go away — in fact, it will likely get worse. Contact us today for a guaranteed bed bug removal in Piedmont. Be sure to tune in for part two to learn even more tips for identifying bed bugs in your home.